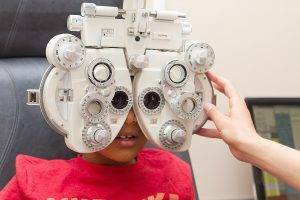 Regardless of your age or physical health, our Chula Vista optometrist encourages you to have regular eye exams. During a complete eye exam, Dr. Efrain Mascareño will not only determine your prescription for eyeglasses or contact lenses, but will also check your eyes for common eye diseases, assess how your eyes work together as a team and evaluate your eyes as an indicator of your overall health. The comprehensive eye exam at Eastlake Vision Center Optometry includes a number of tests and procedures to examine and evaluate the health of your eyes and the quality of your vision. These tests range from simple ones, like having you read an eye chart, to complex tests, such as using a high-powered lens to examine the health of the tissues inside of your eyes.